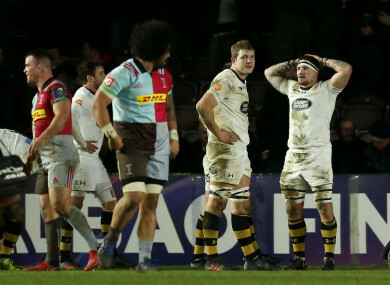 LONDON WASPS’ CHAMPIONS Cup hopes hang by a thread after a remarkable fourth-quarter comeback by Harlequins at The Stoop. A last-gasp try by James Chisholm secured the unlikeliest of bonus point wins for the home side as Wasps, who had James Haskell sent off on 76 minutes for a late tackle on Jamie Roberts, were left teetering on the brink ahead of Ulster’s visit to Coventry next weekend. Tries from Ross Chisholm, James Lang, Danny Care and Elia Elia preceded the other Chisholm’s winning score at the death, but Quins recovered from 21-0 down early doors – and 28-12 down as late as the hour mark – en route to a stunning 33-28 victory in front of a sparse crowd. The Londoners had lost all four of their previous pool games, and so their interests in the competition as far as qualification was concerned had long since been extinguished. Wasps scored four tries of their own and so departed with two bonus points, but defeat means that even a bonus-point win over Ulster at the Ricoh Arena may not be enough for the Premiership side to reach the last eight as one of the best second-placed teams. Wasps need to beat Ulster by 11 clear points or more, while scoring four or more tries in the process, in order to achieve at least second place in Pool 1. If Ulster can depart the Ricoh Arena with a bonus-point victory over Wasps, the Irish province will top their pool. If Ulster beat Wasps without a bonus point, and La Rochelle pick up a bonus-point win over Harlequins at Stade Rochelais, the French outfit will top the group due to a superior head-to-head record with Ulster (La Rochelle beat Ulster 47-17 back in October while Ulster overcame the Top 14 side by the lower-scoring margin of 20-13 today). If both Ulster and La Rochelle win without a four-try bonus point, Ulster will remain top and reach the last eight. Naturally, other results will dictate as to whether a runner-up spot in the pool will suffice in seeing its eventual occupant into the quarters. The permutations for James Haskell may extend well beyond next week, however: his red-card challenge on Roberts, which ended the Welsh international’s evening, will lead to a ban which may affect his Six Nations campaign with England. Haskell showed remorse for the late hit, checking on the felled centre afterwards, but correctly received his marching orders from referee Roman Poite. Email “Great day for Ulster gets better as Quins stage monumental comeback to shock Wasps at the death”. Feedback on “Great day for Ulster gets better as Quins stage monumental comeback to shock Wasps at the death”.